The decoration of the royal palaces of the ancient Middle Eastern kingdom of Assyria was meant to overwhelm the ancient visitor with the king’s power and to reveal the supernatural world where he existed. The twelve reliefs on view decorated the vast palace of King Ashur-nasir-pal II (883–859 B.C.E. ), one of the greatest rulers of ancient Assyria. Completed in 879 B.C.E. 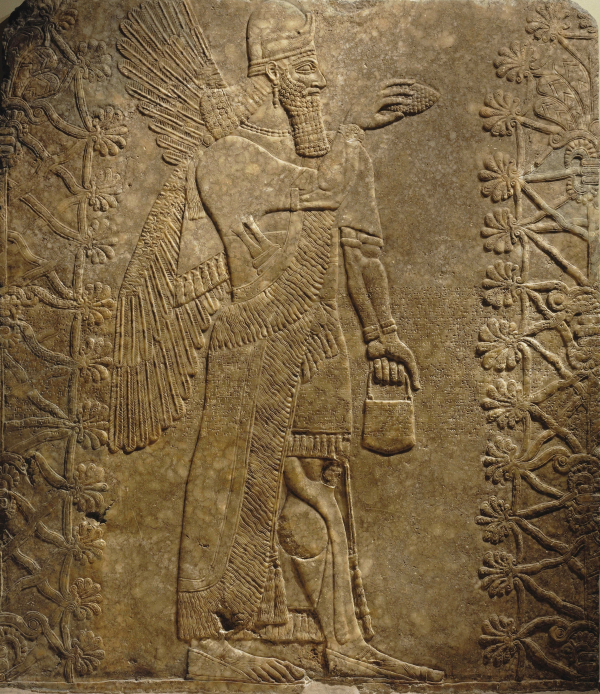 at a site then called “Kalhu” (modern Nimrud, slightly north of Baghdad, Iraq), they were carved with majestic images of kings, divinities, sacred trees, and magical beings called apkallu, or “genies.” The Assyrians believed that apkallu had survived the primordial flood to serve the king. These winged figures could be either human- or eagle-headed. The archaeological site of Nimrud in Iraq suffered serious damage at the hands of the Islamic State (also known as ISIS, ISIL, or DA’ESH) in 2015. Ancient polytheistic images like those displayed here were a particular target. Iraqi forces reconquered the area in 2016. A generous grant from Bank of America in 2018 and 2019 will allow our Conservation department to complete documentation, cleaning, and re-mounting of the six reliefs not previously treated during a 2001 conservation campaign. In 2009 two sloped floors designed to improve wheelchair access to the Kevorkian Gallery were added with funding from the State of New York.